Having a modern and chic looking freestanding bathtub means that you’re going to need an equally modern and chic tub filler, and Aquatica has brought the perfect floor mounted tub filler for this concept. 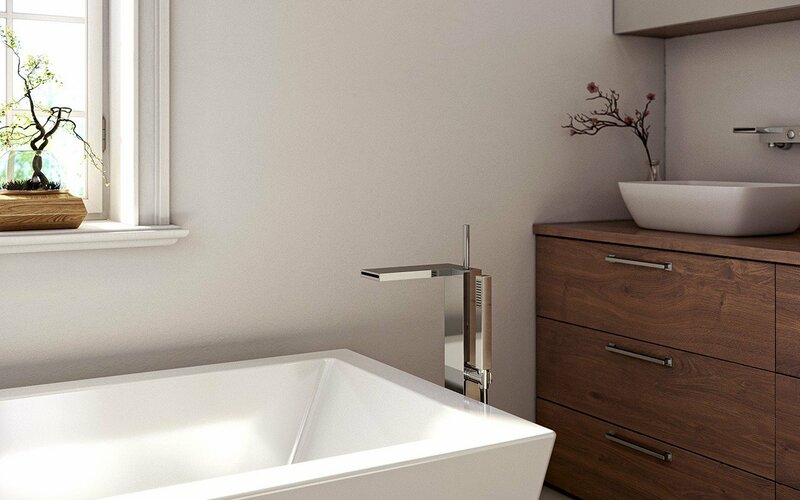 The Modul Bath Filler is a beautifully functional system for contemporary bathrooms, with slick and precise lines, you can choose to place it anywhere around your tub. The floor mounted bath mixer is complete with a mounting system for faucet installation including flexible hose and anti-lime hand held shower head which is the embodiment of technological research, ensuring extremely smooth movement during the mixing process. Designed and made in Italy, from solid brass with a chrome finish for added glam and perfection. This floor mounted bathtub filler will give your bathroom an architectural design.